Do you recognise this bike and driver? A motorbike rider was allegedly sighted travelling in excess of 140km/h in a 40km/h school zone along Princes Highway, Beaconsfield on 20 November. Police are wanting to identify the rider and/or the location of the pictured motorbike. The rider is believed to live locally, wears distinctive red, black and white leathers and has a red satchel over his shoulder. On 19 November, the rider evaded police on Princes Highway in Berwick and was last seen turning right into William Road, Berwick near Wilson Botanic Park. The bike is possibly a red and black Yamaha R6 600, pre 2006, and is fitted with a false number plate similar to 1D-2MK. The plate is black with gold lettering and was also bent up. 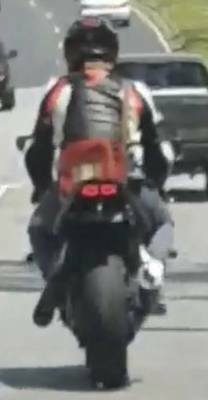 If anyone has seen this rider and motorcycle, has dash cam footage, knows who the driver is or the location of the motorcycle, please contact leading senior constable Jones at the Cardinia Highway Patrol on 5945 2500. All information supplied will be anonymous.